Mitochondria are the powerhouses of the cell. And for mitochondria, much like for double-header engines stacked together in a steam train, working in multiples has its benefits. 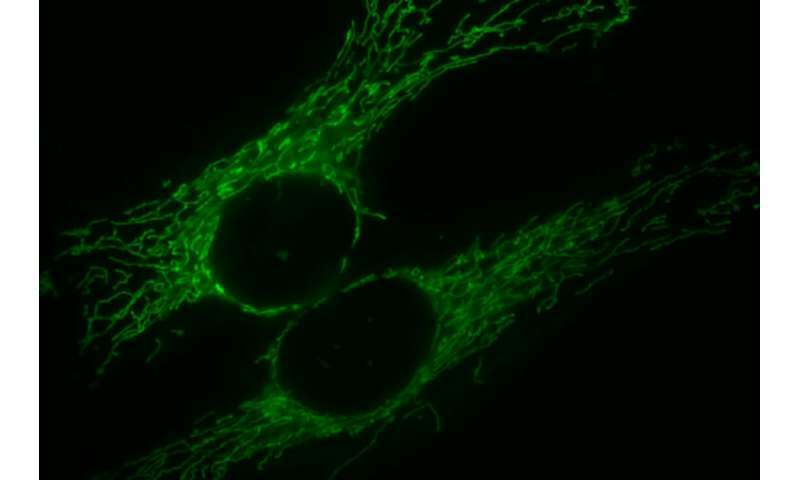 New research from Washington University in St. Louis shows that when cells divide rapidly, their mitochondria are fused together. In this configuration, the cell is able to more efficiently use oxygen for energy. Fused mitochondria also churn out a biochemical byproduct, aspartate, that is key to cell division. This work by researchers in the lab of Gary Patti, the Michael and Tana Powell Associate Professor of Chemistry in Arts & Sciences, was reported in a recent publication in the journal eLife. It illuminates the inner workings of dividing cells and shows how mitochondria combine to help cells to multiply in unexpected ways. Given that cancer cells are known for dividing at a runaway pace, the new findings may have implications for cancer diagnosis and treatment. "Most studies of proliferating cells are conducted in the context of cancer, where scientists are comparing a cancer tissue that's rapidly growing with normal tissue that surrounds the tumor or a normal tissue from a different patient," said Conghui Yao, a Ph.D. candidate in Patti's lab at Washington University and first author of the new study. "These kinds of comparisons are physiologically relevant but have some disadvantages. "A tumor is a very complicated thing, not only because it is made up of different kinds of cells, but also because the environment of a tumor is different from that of healthy tissue," she added. For example, a tumor needs nutrients to grow, but it doesn't have the blood vessel infrastructure that typically supply other healthy tissues in the body. As a result, tumors are often starved for oxygen. But even in the presence of abundant oxygen, cancer cells get energy through a relatively inefficient fermentation process. Instead of using oxygen to burn glucose in their mitochondria to get their juice, cancer cells use an "aerobic glycolysis" process that turns their glucose into lactate. This process is called the Warburg effect. Although the phenomenon has been observed in rapidly dividing cells for more than 90 years, scientists still don't fully understand it. The earliest of explanations suggested that mitochondria in cancer cells are damaged in a way that prevents them from producing energy normally. Yao was familiar with the Warburg effect and its implications. So when she set up an experimental system that allowed her to turn cell division on and off, she was surprised to see that her dividing cells were consuming a lot of oxygen. "Much of the literature had suggested that dividing cells would do the opposite," Yao said. "So we looked into not only why our dividing cells were consuming more oxygen, but also how they were able to consume more oxygen." Part of the beauty of Yao's initial experiment was its simplicity: She was able to measure metabolism in one specific type of cell under two distinct conditions—when the cell was dividing and when it was not dividing. That's also how she was able to hone in on the particular structural change to mitochondria which was driving the efficiencies she observed. "The dividing cells had the same amount of mitochondria per protein or per mass, compared to non-dividing cells," said Patti, whose research is focused on the biochemical reactions that underlie metabolism. "But we did notice when we imaged mitochondria in these dividing cells that they are significantly longer." Longer because some adjacent mitochondria had fused into one—making multiple, adjoined mitochondria into bigger, more efficient, energy-generating machines. The other notable thing that "mega-mitochondria" are particularly good at creating, Yao discovered, is a molecule called aspartate that is essential for cells to replicate. "Recent work from other labs has taught us that one of the most important reasons that dividing cells need to consume oxygen is to make aspartate. So it made sense to us that mitochondrial fusion in dividing cells would increase aspartate production," Yao said. Yao and Patti are not the first to observe mitochondrial fusion. But they are among the first to interrogate mitochondrial fusion with sophisticated metabolomic technologies, enabling a molecular-level understanding of the process as it relates to cell division. The biochemical alterations they observed may represent processes that can be targeted in malignant cancer cells. "It is often stated that rapidly dividing cancer cells increase fermentation at the expense of decreasing oxygen consumption for mitochondrial activity," Patti said. "Our results suggest that at least some rapidly dividing cells increase both processes under normal oxygenated conditions. "Since utilization of nutrients by rapidly dividing cancer cells is the basis for various drugs and diagnostic tests, these findings may have important clinical significance and may represent a metabolic vulnerability in cancer," Patti added.